Description: Warm earth toned Bone Beige and Moccasin Tan stained glass, accented with glistening Root Brown and Sage Green, is used to make this intricate interlocking patterned shade. A Mission style lamp base in a hand applied Mahogany Bronze finish supports the handsome square shade inspired by historic American artwork. 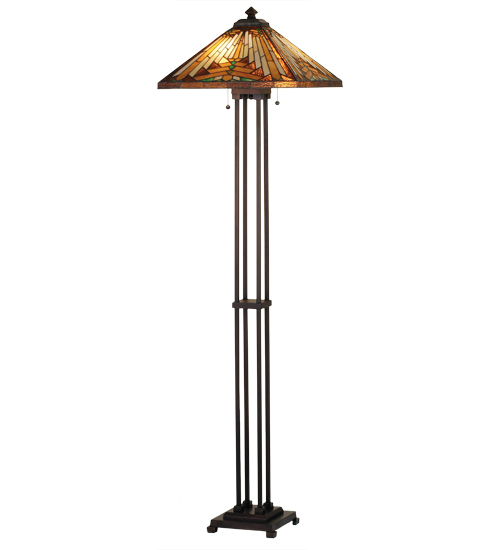 Handcrafted with the copper foil technique developed by Louis Comfort Tiffany, this floor lamp is a true masterpiece.